There has been a nationwide scarcity on lethal injection drugs. How have states responded? Well, in Tennessee Governor Bill Haslam signed a bill into law Thursday that will allow death row inmates to be executed by electrocution if the prisons are unable to obtain the drugs. Much of the scarcity of the drugs used for lethal injections is as a result of many European countries boycotting drug sales for executions. Tennessee lawmakers overwhelmingly passed the electric chair legislation in April, with the Senate voting 23-3 and the House 68-13 in favor of the bill. Concerns about lethal injection also have risen at a time when Tennessee and many states — including Oklahoma, Missouri and Texas — obtain execution drugs in secret from unidentified compounding pharmacies. Death penalty opponents say the secrecy raises the risk of something going wrong. Again I will make a plea here for humanity. Hold on…I am not arguing that we should or should not have executions. That argument is much too volatile, much too emotional, and I do not believe I could have any hope of a consensus on that issue – WHAT I AM ARGUING IS that if we as a society are going to punish the most serious of our offenders with the ultimate penalty, if we are going to take away their lives, we must retain our dignity and do it in as painless and humane manner. I don’t argue for this because I do not appreciate that many of those sentenced to death have done heinous, horrible, torturous things to people. I understand that, and to be honest, if one of my family members was the victim of some of the types of crimes they have committed I would want revenge too. I would want them to suffer for what they did. But we cannot accept that as a society. We must resolve not for revenge, but for justice. We must make up our minds that no matter what someone has done, it will lead to the degradation of our society to allow for our government to inflict torture and physical pain on someone. It is barbaric. It is gruesome, medieval even. 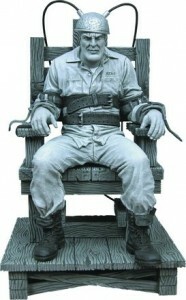 In the past we have seen what happens when people are electrocuted in old sparky. Sometimes they don’t die immediately and they convulse, scream and spasm. If we are going to execute people we must simply put them down like a violent animal. Euthanize them. I save the argument for whether we should keep the ultimate punishment for another day…I suggest you look into those freed by organizations such as the innocence project before you make up your mind where you stand. Is it really ok if we execute a couple innocent people to make sure we kill the bad ones as well?